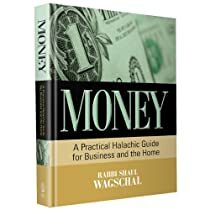 Of all areas of halachah, the laws that address how we should handle our money are perhaps the most relevant to our everyday life. At work or at home, in school or in shul, we constantly confront issues that relate to how we earn and spend money. Learning these halachos should be one of our main goals in life, no less important than learning the halachos of brachos or tefillah. This far-ranging work by Rabbi Shaul Wagschal, a respected posek with many decades of experience, brings that goal within reach. It provides clear answers to hundreds of common issues that arise in every aspect of work and home life. It covers, in detail, the laws of buying and selling, borrowing and lending, interest, employers and employees, tenants and landlords, contractors, tzedakah and much more. Chazal tell us that most people are guilty of theft on at least some level, and it’s often because they simply lack the knowledge of these halachos. But it doesn’t have to be that way. Make a positive change in your life, and start studying this invaluable work today.